11/9/10 What was Meria Heller doing 6 days before 9/11/01? 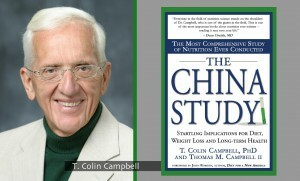 Interviewing Dr. Colin Campbell on his “China Study”. T. Colin Campbell is Professor Emeritus of Nutritional Biochemistry at Cornell University, where he taught and conducted research for over 20 years. He has received more that seventy grant-years of peer-reviewed research funding and authored more than 300 research papers. He is a true scientist and speaks with both evidence and integrity. This is another example of the continuing excellence heard on The Meria Show. An oldie, but a golden one.